Home > Tinfoil Hats, Video	> The Man of the Shroud has Horns? The Man of the Shroud has Horns? A find by Joe Marino. You may want to watch the first 3 minutes of this new video. It is up to you if you want to watch any more of it as the creator of the video argues that the man of the shroud has horns, which we all know is a water stain. He goes on and on and on the explain the ramifications of this and compare the shroud picture to the history of Satanic worship. Years ago, I explained the truth behind the mask of lies about the Shroud of Turin. I made this video as a research device for those who want to grasp and understand the truth behind the story. Please watch the entire video before you jump to conclusions or ask questions. I hope you enjoy. Senior moment, I guess. Sorry, O.K., I should have made reference to your comments back in May. I’ve studied preservation and cleaning methods of textiles for a personal collection of mine. Antique or ancient linen, being a plant fiber, can withstand water. However, when water is applied to a targeted area, the fibers swell and “pushes” collected particles to the perimeter of the water mark which darken over time. I’m not a rocket scientist fellas, but as I’ve studied the shroud I’ve gathered the image itself fades over time, while knowing edges of water stains darken. For the Templars, they would’ve seen a darker image + lighter stain, right? This is absolute rubbish, a waste of time. Please gentlemen, read some history before confusing the Man of the Shroud with Baphomet. Did Michelangelo think about this mythical figure before putting those horns above Moses’ head? Did Jacques de Molay go from Athens to Avignon to meet Pope Clement V to discuss new crusading plans — the Fall of Acre was humiliating to the Templars — while worshipping a devil? See the legend of the first photograph to note in whose honour the church (with round) was consecrated. This is just one lead, the other one, details about which, with colour illustration, are given in Professor Danin’s book “Botany of the Shroud” is also on the waiting list. The Knight Templars’ ‘Head’ was reported (by Hugues de Payraud) to have “four legs: two at the front and two at the back”. 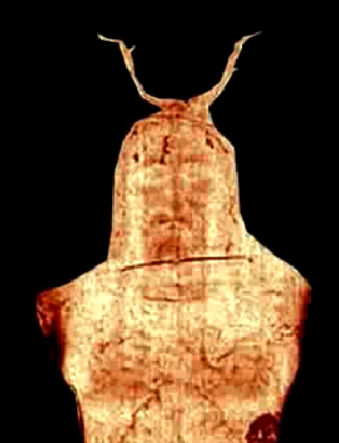 Actually the Shroud image does show a bearded head with two frontal imprints of legs and feet (the latter apparently ‘missing’ for a few Shroudies though) AND two dorsal imprints of legs and feet. Typo: the frontal imprints of two legs and feet (the latter apparently ‘missing’ for a few Shroudies though) AND dorsal imprints of two legs and feet.